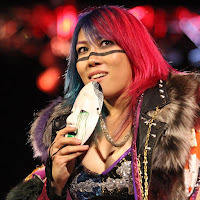 There has been talk of Asuka turning heel, according to Dave Meltzer. Asuka has been booked a bit weak following her WrestleMania 34 loss to Charlotte Flair and the feud with SmackDown Women's Champion Carmella. Asuka is not booked for a match at tonight's SummerSlam pay-per-view. There's no word yet on when Asuka might turn but WWE officials do have plans for her, despite the booking as of late. It's possible the heel turn happens before the first-ever all-women's Evolution pay-per-view in late October.